Protesters across the EU and US have staged a day of action against an emerging free trade pact between the two continents. They fear it could see corporate interests undermine workers’ rights and consumer protection. Crowds have gathered in London, Munich, Brussels and other major European cities to march against the Transatlantic Trade and Investment Partnership (TTIP) and similar secretive international trade deals. The day of action consisted of over 700 separate events, including rallies, marches and public statements. All were organized by a variety of civil rights movements in the EU and across the Atlantic. Once the attendance has been officially counted and thus confirmed, it could mark what might have been the largest protest against free trade agreements to date. Most protests have taken place in the center of EU economic activity – Germany. Berlin police said the the crowd was at least 4,000-strong. It formed a human chain from Potsdamer Platz public square, past the US Embassy and through the iconic Brandenburg Gate to the offices of the European Commission. In Munich, police estimated that the number stood at 3,000, while rally organizers said there were as many as 15,000 people present. “We are convinced that the entire public interest is at stake, whether water, energy, health, and public transport. The communities are largely deprived of their ability to act,” Organisers in the German town of Schnaittach said. Protesters say TTIP and similar deals will endanger workers rights and the environment, as well as potentially leading to the privatization of public services and an influx of unregulated genetically-modified foods. "For the last decades, secret trade and investment agreements have been pushed by corporations and governments, damaging our rights and the environment,” says a statement on globaltradeday.org, the website of one of the groups behind the protests. According to the latest YouGov survey, 43 percent of Germans believe that the agreement would have a "bad" impact on their country. Some 30 percent Germans see the agreement as "good." Seven other EU countries’ data showed similar negative outlook. Meanwhile in Spain's capital Madrid, over 20,000 people came out to have their voice heard. Another 4,000 showed up in Barcelona to protest against the proposed agreement. 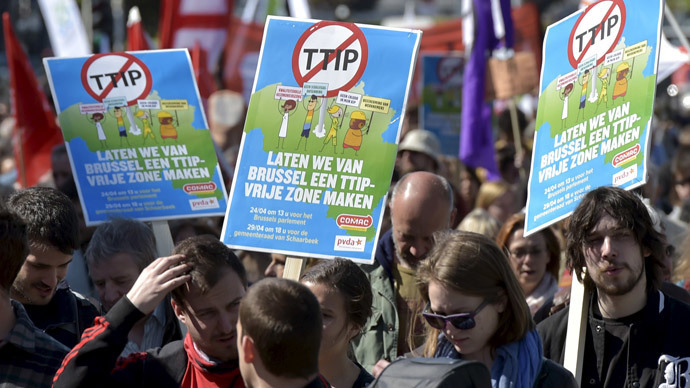 Several thousand people also joined a rally against TTIP that took place in Brussels. Parties and organizations like Podemos, Die Linke, Syriza and Greenpeace joined the protest, as well as several unions. Local newspapers in Austria report that over 22,000 protested across the country on Saturday with 15,000 alone rallying in capital Vienna. Meanwhile, in the US, people also marched across dozens of cities from New York to San Francisco, protesting against outsourcing jobs, environmental, health, and food safety. A day before the global action day, US President Barack Obama dismissed concerns that TTIP, saying the agreement would ‘absolutely’ benefit US workers, as he hopes to strike the deal with Brussels by the end of this year. “Now that Congress is considering bipartisan legislation, TTIP negotiations need to make major progress this year,” Obama said Friday. The agreement is being negotiated behind closed doors, with the next round of talks scheduled for Monday in New York. It will open free trade between the EU and the US, bringing down restrictions on the flow of goods. Its sister agreement, CETA (Comprehensive Economic and Trade Agreement), is aimed at achieving similar links between the EU and Canada. However, the deal has met opposition in Europe, with a recent European Parliament vote on its adoption being postponed after a draft resolution led to almost 900 proposed amendments. The previous day of action took place in October 2014 and was hailed as a success by the Stop TTIP group, with hundreds of events across Europe, thousands of signatures on petitions against TTIP, and increased media attention on the movement.